An Armor-level Mutant Digimon that evolved through the power of the "Digimental of Light". It is an extremely rare Digimon that is seldom seen even in the Net Ocean. Usually, it moves about while going with the current near the surface, but when fighting with the enemy, it moves at astonishing speed with the propeller on its tail fin. It is said that although the patterns on the surface of its body have meaning, they also differ for each individual, but because there are a few cases of witness accounts, the truth of the matter is uncertain. Also, it is a precious species that produces antibodies against computer viruses within its body. 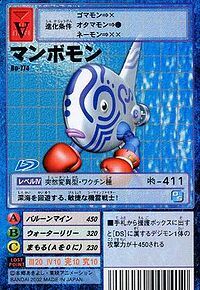 Its Special Moves are spewing out a large amount of "Mini Manbomon-shaped Bubbles" from its mouth (Balloon Mine) and pummeling the opponent with the gloves on both of its hands earnestly (Global Glove). An Armor-level Mutant Digimon that evolved through the power of the "Digimental of Light". It is an extremely rare Mutant Digimon that is seldom seen even in the Net Ocean. Usually, it moves about while going with the current near the surface, but when fighting with the enemy, it moves at astonishing speed with the propeller on its tail fin. It is said that although the patterns on the surface of its body have meaning, they also differ for each individual, but because there are a few cases of witness accounts, the truth of the matter is uncertain. Also, it is a precious species that produces antibodies against computer viruses within its body. 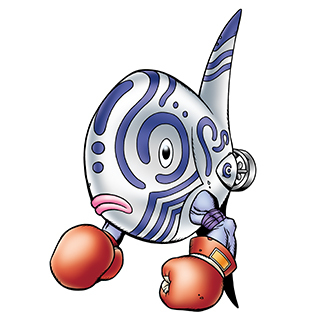 Its Special Moves are spewing out a large amount of "Mini Manbomon-shaped Bubbles" from its mouth (Balloon Mine) and pummeling the opponent with the gloves on both of its hands earnestly (Global Glove). A Mutant Digimon that evolved due to the Digimental of Light. 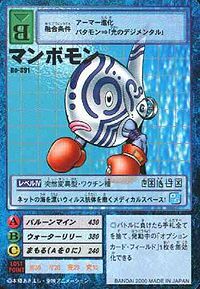 Special Moves - Spews out a large amount of "Mini Manbomon-shaped Bubbles" from its mouth (Balloon Mine) and repeatedly strikes the opponent with the gloves on both of its hands earnestly (Global Glove). n., From mambou (翻車魚（マンボウ）), the Japanese name for ocean sunfish (Mola mola). Balloon Mine  バルーンマイン Barūn Main Balloon Bomb / Balloon Mine Spits out a large amount of mini-Manbomon-shaped bubbles from its mouth. Global Glove  グローバル・グローブ Gurōbaru Gurōbu Global Gloves Repeatedly punches the opponent with the gloves on both its hands. Petty Glove  ペティ・グローブ Peti Gurōbu Combo Gloves A combination of high-speed punches. Water Lily  ウォーターリリー Wōtā Rirī Water Knuckle / Water Lily Fires a watery beam from its mouth. Manbomon is the partner of Takaishi Takeru. 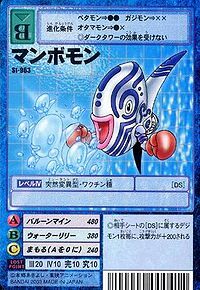 Manbomon is an obtainable evolution in Gaomon's galaxy (if you have obtained the Digimental of Light and Patamon as an evolution) and Falcomon's galaxy (if you have obtained the Digimental of Light and Otamamon as an evolution). You must have obtained Manbomon in order to unlock Whamon as an evolution in Falcomon's galaxy. Manbomon is an Adult-level, Metal Empire Digimon that can be encountered at Sea Precipice Jerapilus. 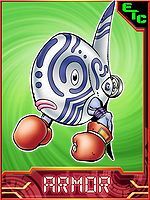 Manbomon is only obtainable as a collectible card. Its card is part of the Digimental of Light (光のデジメンタル Hikari no Dejimentaru) set. Manbomon is available as a Digimon Medal. Manbomon evolves from Guilmon and Bushi Agumon and can evolve to Rize Greymon. This medical base scatters virus antibodies that drift around the Net Ocean! This nimble sea mine fighter circles the deep waters! This page was last modified on 13 April 2019, at 12:54.